Now, saying this is like asking if white people eat a 2 piece w/biscuit & red, beans and rice from Popeye's I suppose... but anyway. This past Friday I attended a scheduled business lunch with some Directors and VP's from my organization. Now, the location that had been selected prior was a steak restaurant in downtown DC. About 5 minutes before we rolled out I was informed that there had been a change in venue. The primary facilitator of the meeting wanted to go to a sushi restaurant instead. This was a spot in downtown DC that people and critics supposedly ranted and raved about. Now I've had some interesting foods in my life and had only tried sushi once and wasn't too fond of it. But since I was on the list of attendees for the meeting, I went along and hoped for the best. We got there, sat down and looked over the menu's that were there. I swear, I didn't know what the hell I was reading. I looked up to see what everybody else was doing and they were all calm and what not ready to place their order. I looked at the menu again and saw some Teriyaki Chicken and decided to order that. However, the sushi menu was passed to me and like an idiot I tried to play it cool. I saw something that said Crunchy Shrimp Roll and decided to order some sushi like the rest of my crew on top of my previous selection. So I'm sitting there talking with my colleagues and at the same time observing others in the restaurant and what they're eating. There was no silverware on the tables, just chopsticks. Now, I've used chopsticks before, but I've always had the option of silverware if I wanted it. This felt kinda weird. The waitress brought some salad and a soup and I ate that with no problem. One of the guys at the table joked (or at least I think he was joking) that the salad dressing was made from fish eggs. Oh well... I ate it anyway. I sat back and drank my green tea and responded to a few emails on the Blackberry. Shortly thereafter, the food came. The chicken was real tasty and I tore that up. The sushi that I ordered was on the other side of the tray and so I figured I'd try my hand at some sushi that was closest to me. I mixed up some soy sauce with the Wasabi into a nice lil' concoction, grabbed the sushi from the tray and dipped it in. My co-worker advised me that I had just picked up some sushi with eel in it. Well, you know the kid had to maintain his composure and act like he had been there before. I put it up to my lips, took a bite and heard a loud crunch follow by what seemed like a huge burst of goo in my mouth. The regurgitation occurred within seconds. I looked around to see that no one was paying attention to me, quickly reached for my napkin and deposited the entire mass into it. Yuck!!!! I grabbed my tea and tried to drink the taste of the sushi out of my mouth. Now, you'd think I'd give up after that right? Ohhhh noooooooo... I had to keep on with the facade to impress. I decided to eat two more selections of sushi, some tuna and the crunchy shrimp that I had ordered. Now, keep in mind that I'm allergic to shellfish. Yes, I was playing Russian Roulette with my health tryna be like the other executives in there. Luckily I didn't have any reactions or anything. 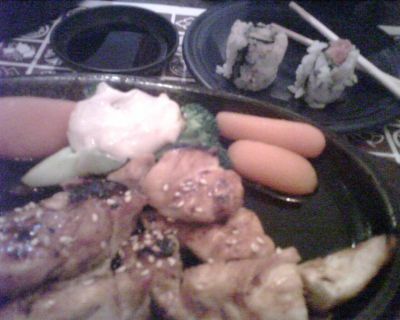 While I was on the Blackberry ,I snapped a few pics of my lunchtime meal. When I got back to the office, I had to laugh at myself. No one else in the place knew what had taken place. As far as they knew, I enjoyed myself. Lord please don't have these folks asking me to go there with them again, I prayed silently. I just don't get how people eat sushi. I mean, it looks so beautiful and tastes so nasty. I know a few of my Black friends who swear by sushi bars and God bless them. This is one brotha who you aint gotta worry about eating sushi again. That leads me to ask... do you like sushi? Was it something that you liked from the jump or something that you grew to enjoy? I'm just curious about that. I don't see myself eating it again anytime soon, but I suppose you can never say never. I had never tried it 'til college, then I got hooked. You can build your tolerance/taste for sushi by ordering California rolls which are really nothing but cucumber, carrot and avocado--boring but for a novice, it'll impress. Hey, who you got for the Super Bowl? I love the Bears but I'm leaning towards the Colts. Love sushi! If you have to go again, I agree get the california roll. It is the safest thing. It is made of imitation crabmeat so you shouldn't have to worry about a reaction to the shellfish. Sorry about your experience. Son you should have just said I'm allergic to shellfish instead of trying to impress.. LOL don't mess with your health like that again!!! did ya'll got to Cafe Asia? that's my spot! Don't do sushi!!! I tried it once and almost threw up. It took me a long time to try it, but a couple of friends finally dragged me about 2 years ago. Now I love it. 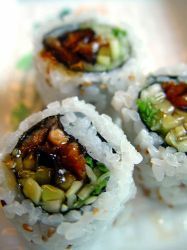 I don't eat anything raw, but I love most cooked rolls like shrimp tempura, california, or salmon skin. I think it's definitely an acquired taste that you either love or hate. I am a sushi eating fool... its great for the system and healthy as hell! I ate it on a date trying to impress the honey with my explorative manners.... and my @ss was hooked! i LOVE sushi.....ooooh weeee...the manager at my fav sushi spot knows me so well now she gives me hugs when i come in...i love california rolls, shrimp tempura rolls, spicy tuna rolls, spicy salmon rolls, etc...i dont know if it is just in california but you can even get great sushi in the mall food court..
First, i'll commend you for giving it a go and for going with the bit. Personally, i love sushi and eat it often. I liked it from the start and save for a few pieces, i like the various kinds. while in Honolulu, i ate at a Japanese spot called Todai which is a buffet. I ate more sushi, tempura, and other delights than i ever had, which furthered my liking and saved me money for the future should i have ordered it on a whim. Sushi is definitely an acquired taste and not all sushi is raw seafood. Again, mad props to you and now you've given me an idea for my dinner tonight. I'm with 1969. Shrimp Tempura and spicy tuna. LMAO!!! This post was hilarious...you are crazy!!! 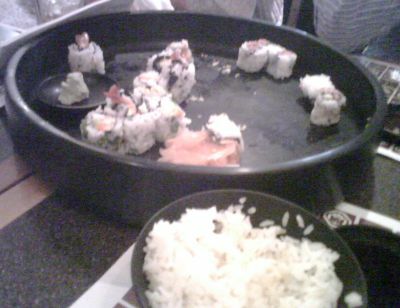 I actually love sushi...had some last night. It's funny too cause the eel is actually my favorite. I don't remember any goo though so not sure what that was. i love sushi, i got hooked on it while living in hawaii and having access to great fresh fish and real sushi chefs from japan. my favorite is sahshimi which are the slices of raw fish...yummy yummy good for my tummy. i eat damn near anything out of the water but i'm not really into meat though! I dont like any fish at all - so I know I wouldnt like UNcooked fish! lol Now, I will eat some shrimp, but only if theres cocktail sauce. I have eaten tuna casserole before, and not thrown up. Ive also had some barbequed catfish once, and that was good. But I generally try to keep myself away from that ickiness. I actually just came across your page.. and it REALLY made me smile. I can imagine being the one person to see you in the corner and laughing hysterically. I LOVE sushi.. my mom refuses to go to lunch with me and try it though. Maybe it's a generational thing on top of just not wanting to eat it. A lot of comments here are saying "ew, eel" but eel (which is cooked when used in sushi, btw) just looks and has the texture of normal white fish. Normal COOKED white fish. Very un-scary. And there shouldn't be any goo in it, like someone else said, so I'm not sure what was going on with that. Maybe it was some kind of sauce? I have been a sushi eater for a few years. I started out slow and gradually increased to like "most" of the things I can order.